Pelicans, flamingos, monkeys and even hyenas are under threat in Senegal along with the livelihoods of the local people as thick clusters of mangroves are disappearing. And it seems that not even an ancestral spirit can save them. The protected marine area (AMP) of Joal in western Senegal, just to the north of the Gambia, is home to an incredibly rich biodiversity. The hardy mangrove shrubs thrive in salty water, thick mud and hot, humid conditions that would kill most other plants. Part of Senegal's peaceful Petite Cote, Joal's mangroves are being eroded by a combination of factors, including global warming, deforestation, public works, oyster and clam fishing, salination of the fresh water river and drought. All along the riverbed, great swathes of sandy dunes have appeared in place of the once suffocating canopy of mangroves. 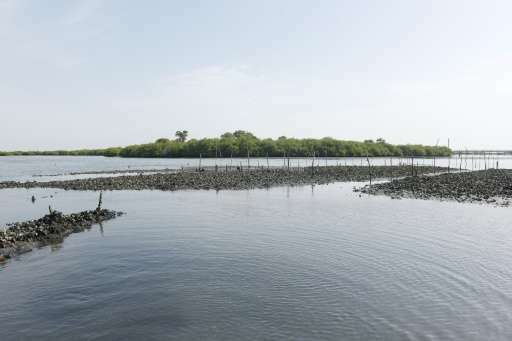 "The empty spaces are areas where the mangrove has disappeared," said Abdoulaye Sagna, a manager at the Joal AMP. Mangroves are not just tough survivors. Scientists now believe the swamps are hugely important to the well-being of the planet as a whole. Senegal's mangrove system supports a vast range of species and organisms. Baobab trees and acacia shrubs grow in between the tangled roots, which are a habitat for molluscs, crabs and insects. Animals such as monkeys and hyenas also live in the mangroves, and flamingos, pelicans, terns, herons and other types of birds nest in the trees. "All these species are victims of the disappearance of the mangrove," added Sagna. 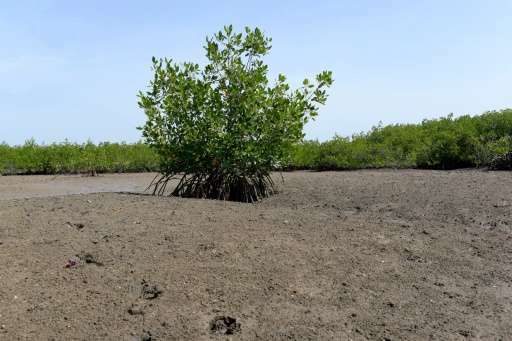 The protected area may be vast but outside of the AMP, the mangrove is receding, according to Abdou Karim Sall, a member of the Joal AMP's organising committee. 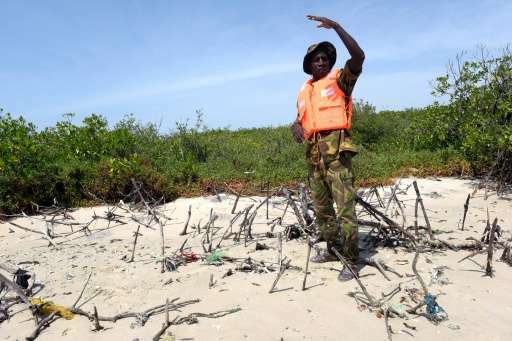 But he insists that the establishment of the 174-square-kilometre (67-square-mile) protected area has had a positive effect on safeguarding the local environment. "There was nothing here, no mangroves, but from 2009 we started reforesting," said Sall. "In villages not covered by the AMP, the mangrove is more degraded. We fear it will disappear in certain areas where entire hectares have been cut down." Despite the reforestation policy, Senegal is losing much of its mangroves, not least to those looking for firewood and construction materials. "Senegal has lost 40 percent of its mangroves since the 1970s," said ecologist Haidar El Ali, a former minister of the environment. As the mangroves recede, it is becoming harder to find oysters and clams, which are among the mainstays of the local economy. "Before, all you needed to do was go 10 metres (32 feet) into the river to find oysters and clams. But now, you have to go much further," complained Marie-Madeleine Diouf, head of a group of seafood traders in Joal. "We can't find the quantity we want and demand is increasing." Other than the abundant mollusc fishing, Joal—famous for being the birthplace of Senegal's first president, Leopold Sedar Senghor—is also known for tourism and local handicrafts, based on clam shells and sea snails found at the island of Fadiouth, which is linked to Joal by a bridge. But that has attracted many unscrupulous outsiders, and not even a local spirit in the deeply superstitious society can keep them from exploiting the mangroves. "Joal's ancestral spirit, Mama Ngueth, the town's protector, banned the cutting down of mangroves," said Sall. "Everyone respected that ban and belief in that spirit was a factor in the conservation of the mangrove. "But now there are a lot of migrants in Joal who couldn't care less about this spirit, or the conservation of the mangrove." 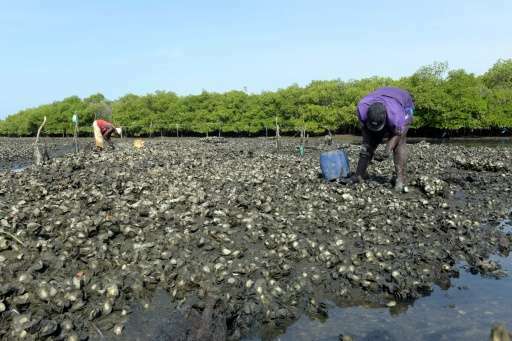 One solution has been to build an oyster farm in Joal to boost production. Yet another is to try to protect young molluscs. Oyster farmer Leopold Ndong wields a knife to cut oysters from the intertwined mangrove roots to "plant" them in mud. "These are spat, baby oysters... After a year they will be mature," he said. According to Diouf, the fight to preserve the mangroves is not a forlorn one and is worth the effort. "We have to replant every day because people keep cutting (down mangroves)," she said. "People will keep cutting, and we'll keep replanting."